I am pleased that you took the time to come to my site. It’s no coincidence that you are here. Spirit guided you here because you are looking for answers, closure and/or healing. As a medium I give readings by communicating with the spirit world and your loved ones on the other side. You will receive accurate and personal messages that will leave you with no doubt that it was indeed your loved one coming through. I also give psychic readings where I concentrate on just you (the person I am giving the reading to). There are many people that decide they would like both mediumship and psychic readings. I can do this in the same session if that is what you wish. I do this by doing them one after the other. I am flexible and each reading is very personal. If you feel drawn to book a reading with me, you can click on “Book a Reading” on the menu. That area will give you information on my rates. I keep them very reasonable for the purpose of those really in need of a reading to have the opportunity to do so. I look forward to talking with you soon. To read what people are writing about me, please click on Testimonial’s on the left menu. In early 2009, I was geared up to write a book because everyone else was doing it. I didn’t have much experience as a psychic medium yet; the book was intended to be an autobiography of myself—how boring. Mind you, I am not a professional writer; most people who put out books are not. That is why there are editors and proofreaders. Thank God for that! In any event, I ended up with 15 chapters by mid-2011. Now what? I shared some of my chapters with friends, and as poorly written as those chapters were, they liked them. Some were surprised at the content. Surprise, I am a psychic medium! Well, it was a surprise to those who didn’t already know it. As the years went by, my chapters collected dust on my computer’s hard drive. I did not yet know what to do with them, but I had backed them up in case my hard drive crashed. I feel that this book was meant to happen, but I wasn’t ready. I felt that my Spirit Guides and Angels were holding me back—stopping me because publication would have been a mistake with the content as it was then. I didn’t have an important message to give the world yet. Through the years, I gave mediumship readings, but there were some that stood out; those were the ones that the other side was waiting for. The book gradually took shape. It includes glimpses of my personal life that highlight some of the hard lessons I have learned in this lifetime so far. My life isn’t over yet; the lessons will keep coming. My Spirit Guides and Angels don’t impose anything on me; they do not infringe on my free will. But they do make suggestions. I felt that this book should be a testament as to how powerful a mediumship reading can be, and the positive results that often follow. It’s a method of healing. The more powerful the evidence that the consciousness survives after the physical body has died, the more powerful the healing’s potential. I believe this book is important. In it, I share my early struggles with gifts I didn’t understand. Other important chapters will help validate the impact a mediumistic reading can bring. A Life-Saving Reading, Giving Back – Voice of Our Angels, and Proof Positive make clear what the readings really are all about – closure and healing. You will read how my spiritualism cleared my life up. I have learned how much I am loved by those heavenly beings I describe in this book; we all are. They don’t wave a magic wand and make everything negative in our lives go away; we have to be active participants in healing ourselves. But when we listen, they aid us. As in every case, God gave all of us the gift to heal ourselves and to heal others. There are probably as many different approaches to these gifts as there are individuals in the world. My methods have evolved within the unique experiences and circumstances of my life. 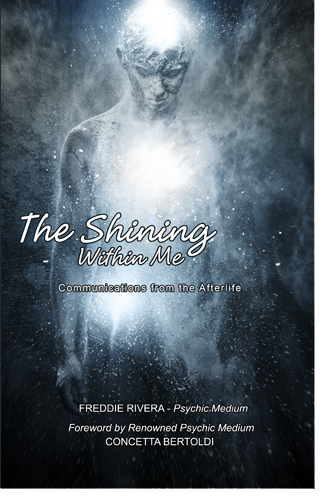 This true account of the life of Psychic Medium Freddie Rivera will leave you spellbound and in awe of what lies beyond the physical experience we have here on earth. Freddie was born and raised in New York City. The beginning of his life was a difficult one, and it only became more challenging as he got older. Freddie was born a natural medium, meaning his abilities became fully active at age six. As a small child, he suffered and endured frightening and confusing paranormal activity. He saw, heard and felt what most adults would find unfathomable. He doesn’t hold back on the negative aspects of being a psychic medium. One of his first frightening experiences was when he saw a “Grim Reaper” like spirit at age six. He had one experience so frightening that he shut down and was forced to face a lonely, almost unbearable existence through his road into adulthood. He had nowhere to turn; society did not acknowledge much less even speak about the things that Freddie was going through. When he was old enough to go out on his own, he joined the army and traveled and was exposed to places that were almost too much for him to bear; sensitive as he was to supernatural activity. He takes you through the rough road in the jungles in Panama and the freezing temperatures at the glaciers in Alaska. He experienced a Nazi Concentration Camp, on a level that was different from the rest of his fellow soldiers. Freddie had profound yet misunderstood experiences that he himself tried to ignore and keep at a distance. He was unaware of the true meaning of his abilities and was on his own with the overwhelming activity within and around him. He felt he could not share the occurrences in his life as he was afraid other people would think he was insane. On Freddie’s path to self-discovery, he finds himself in conflict with the true calling he was not yet aware he possessed. There are areas in the book that are very frightening, and leaves us to wonder. The unknown is most frightening with lack of knowledge. Freddie learns to understand and face it head on. He learns what he really is capable of. You will journey with him while he finds himself and what made him who he is today. When Freddie discovered the true meaning of his gifts, he also discovered his mission in life and his life’s calling. Learn with Mr. Rivera as he shares his lessons and embraces and evolves into an experienced and seasoned Psychic Medium. Freddie uses his gift of mediumship to bring closure to those that are in deep grief by bringing through loved ones that have died. He heals the mind in just one reading with extraordinary and instant results. He helps the bereaved to understand that their loved ones are still with them; that in turn gives them hope and aids in their finding purpose and joy in their lives again. This book will take you through the highs and lows of what it means to carry the burdens turned gifts by the man Freddie Rivera. His last Chapter entitled “Proof Positive” provides real testimonials by real people and the readings they received from Freddie. These testimonials include personal contact information to authenticate that these are real readings that were given to prominent authors, lawyers and everyday people. There is so much I want to learn from you, Freddie 🙂 How is your book coming along? My book is going well, takes time and patience. Come visit me on my homepage. I enjoyed your book immensely! It is very inspiring and honest. Hmmm that feeling when an enjoyed book is ending… thank you! I’m the founder of the annual Afterlife Awareness Conference (www.AfterlifeConference.com), and also an author and death educator. When I booked my reading with Freddie, I didn’t use my real name, because I’m well-known in this field, and my story is very public, so I didn’t want him to have any preliminary information about me. Not only did he give me an amazing reading about my son on the Other Side (with details of his illness and disability, his physical appearance and some very evidential messages), he also “heard” my real name. My son’s name is Daniel, and I had my last name changed to Daniel after he died. But I gave Freddie a fake name. During the reading he said, “There’s another Daniel here… someone else named Daniel,” which was, of course, me! He also brought in a friend of mine who recently died by suicide… he got that her name started with “K” and that there was something going on with her head (she shot herself in the head). In my role with the Afterlife Conference, I’ve worked with some of the world’s top mediums, and Freddie is one of the best I’ve seen!